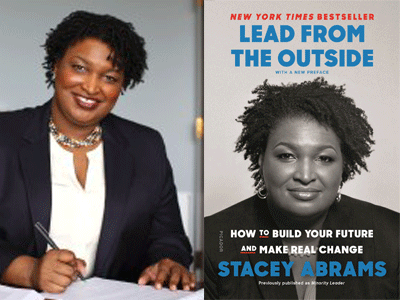 Stacey Abrams is an author, serial entrepreneur, nonprofit CEO and political leader. After serving for eleven years in the Georgia House of Representatives, seven as Minority Leader, in 2018, Abrams became the Democratic nominee for Governor of Georgia, when she won more votes than any other Democrat in the state’s history. Abrams was the first black woman to become the gubernatorial nominee for a major party in the United States. After witnessing the gross mismanagement of the 2018 election by the Secretary of State’s office, Abrams launched Fair Fight to ensure every Georgian has a voice in our election system. Over the course of her career, Abrams has founded multiple organizations devoted to voting rights, training and hiring young people of color, and tackling social issues at both the state and national levels. She is a lifetime member of the Council on Foreign Relations, the 2012 recipient of the John F. Kennedy New Frontier Award, and a current member of the Board of Directors for the Center for American Progress. She is the author of Lead from the Outside, a guidebook on making real change, as well as eight romantic suspense novels under the pen name Salena Montgomery. Abrams received degrees from Spelman College, the LBJ School of Public Affairs at the University of Texas, and Yale Law School. She and her five siblings grew up in Gulfport, Mississippi and were raised in Georgia. Members pre-sale starts Wednesday, April 10 at 10am. To become a member, click here or call 415-563-2463.